This story has been updated. Please see below for further updates. 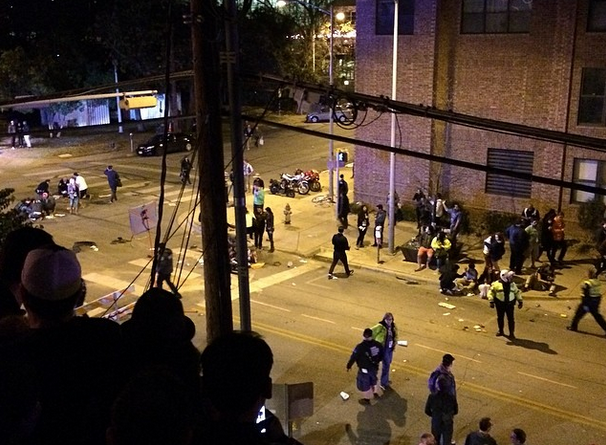 Tragic news out of Wednesday night’s South By Southwest festivities, as a car reportedly drove through the throngs of concert goers, killing 2 and injuring 23, including five critically, according to Austin’s ABC affiliate KVUE. A suspect is in custody according to Austin police, and will be charged with two counts of capital murder. A third victim died from injuries sustained during the accident on Monday, March 17th (see below). The incident happened on Red River St., between 9th and 10th Streets, near the heart of Austin’s downtown entertainment district. Reports say victims were found over multiple blocks. Red River, along with Austin’s famous 6th Street, frame the heart of Austin’s downtown music corridor, and is the epicenter of the city’s SXSW festivities. Austin’s famous Mohawk venue sits right near where the incident occurred, and Stubb’s, where Lady Gaga and other big performers make their SXSW appearances, is right down the street. The intersection is also very close to the Austin Police headquarters. According to witnesses, the incident happened just before 1 AM early Thursday morning. Witnesses say the suspect hit a pedestrian, sped up, and hit several more. According to the Austin America Statesman, the two people killed were riding on a moped. The suspect reportedly also hit a taxi, injuring people inside, and a parked van before trying to flee on foot. The whole incident transpired on just over a minute. Austin Police Chief Art Acevedo at a press conference at 2:30 AM early Thursday morning said the incident started as a DWI stop at a gas station on the Interstate 35 access road right near where the incident took place, and right by police headquarters. The suspect then fled the wrong way down 9th street—a one way road. The suspect eventually wrecked out, was tazed, and taken into custody. Much of Austin’s downtown district is cordoned off to regular traffic during SXSW, and is only accessible by vehicles with permits for performers and personnel, but near 9th street is usually where the pedestrian barrier starts. Multiple reports said the suspect drove through barricades during the incident. Many of the victims were waiting in line for a Tyler, The Creator show at the House of Vans showcase at the Mohawk venue. The performance was subsequently canceled after the incident. Anyone with further information on the incident is asked to contact Austin police at (512) 974-5186. Photo of injured pedestrian from Austin American Statesman. UPDATE 3/15: The suspect in the incident has been identified as Rashad Charjuan Owens, an aspiring rapper that uses the pseudonyms KillingAllBeatz or K.A.B254 that was on the way to a a 1 AM performance at Club 1808 near 12th and Chicon Streets. According to the arrest warrant, and officer looking for drunk drivers saw Owens in a 2012 Honda Civic driving without his lights on and proceeded to try and make a traffic stop. The 21-year-old rapper, worried that he would be arrested and go to jail for multiple arrests warrants stemming from a custody dispute, decided to flee. Owens blood alcohol level was .114. The legal limit in Texas is .08. Owens is being held at the Travis County Jail held on a $3 million bond on capital murder charges. In Texas, whenever two murders happen in the same incident, it is automatically charged as capital murder. The two victims have been identified as Steven Craenmehr, 35, an Amsterdam-based employee of MassiveMusic, and Jamie Ranae West, 27, of Austin. UPDATE 3/17: A third person has died from injuries sustained during to the crash. 26-year-old Sandy Le from Austin died at University Medical Center Brackenridge Monday morning. She was one of 5 victims listed in critical condition. Photo via Matthew Keys on Twitter. Horrible. May the ones who died rest in peace and may the injured enjoy a speedy recovery. I Fu**ing hate drunk drivers!! Is it really that hard to wait out a hangover? “I hate drunk drivers” come on… these actions had very little to do with be drunk. At that b.a.c. his judgement and reflexes may have been impaired, but not to the extent that it would make him think that it was ok to do this. I agree. His car did not spiral out of control. He mercilessly ran his car into a crowd of people and did not even stop because he feared getting arrested. What a despicable animal? What a horrible world we live in that there are so many people that place such little value on the life of another human being. Thoughts and prayers go out to the victims and their families. It looks like a war zone. Prayers to the people affected.